In this episode, we take a look at horror-adjacent nominations for the 2018 ENnies, and then we do some riffing on how to make bad films into fertilizer for games. 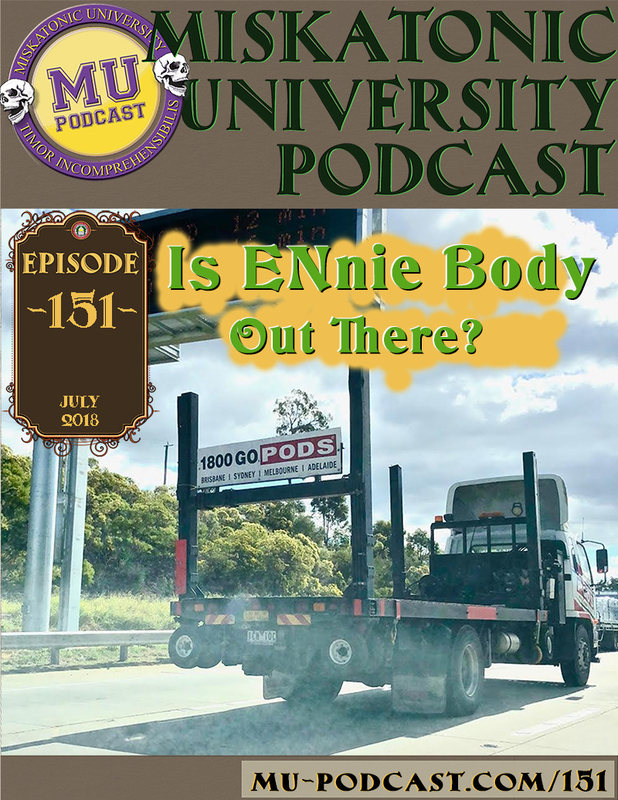 This episode was recorded on July 5, 2018. First, thanks to everyone once again for making our Sesquicentennial so memorable! IMPORTANT CORRECTION: During the recording for this show, we mentioned that HPLHS prop sets for Masks of Nyarlathotep had sold out. This is not the case at all. There is a quirk with the website that displays “sold out” before it launches, but the text clearly explains that this is not true. Please accept our apologies for the error! ENnies! There are several horror-adjacent products on the list of nominations this year. Click here to vote for your favorite ENnie nominees! And…MU PODCAST ALSO GOT A NOMINATION! Voting is open through Saturday, July 21, at 11:59pm Eastern Daylight Saving Time. The winners will be announced at the awards ceremony on August 3rd at GenCon. There has been a little reorganization at Stygian Fox. Stephanie MacLea wrote on the publisher’s Facebook page, that frequent editor Jeff Moeller will be moving on to work on other projects, and after a series of effusive “thank yous,” she said: “we feel that Jeff and I have kinda run our course in terms of joint projects.” But before that, comments on the Kickstarter page for Fear’s Sharp Little Needles were initially tense and suggested the split was not on such good terms. But backers for Fear’s Sharp Little Needles have received a version of the book in PDF for review, and proof copies are on their way back from the printer. At the time of recording, Tails of Valor and Terror, the Cathulhu scenario collection from Golden Goblin Press that’s paired up with a feline horror fiction collection, was past the $9,000 mark out of its $12,500 goal with 148 backers and many days left to go. This looks on pace to fund and overshoot to reach some stretch goals, which includes extra art, bookmarks, stickers, and extra fiction stories. By the way, Sixtystone Press is offering a coupon to backers (above the $1 level) for 25 percent off the the purchase of the rules Cathulhu – Velvet Paws on Cthulhu’s Trail. YSDC has re-launched its longstanding newsletter after purging 18,000 email addresses. The new one is called Yog-Sothothery. It’ll come out monthly-ish, and you can sign up on the site. We’ll have link to the YSDC blog that has instructions for how to subscribe. They are giving away a copy of Fall of Delta Green to one subscriber. Fall of Delta Green from Pelgrane Press is now available. This setting adapts Arc Dream’s Delta Green RPG to Pelgrane’s own Gumshoe system, with Kenneth Hite creating a work focusing on the Delta Green of the 1960s leading to the official dissolution of the organisation at the end of the decade, following events in the jungles of Indochina. Masks of Nyarlahotep has been released! We have it in PDF currently, with the print release not yet announced. 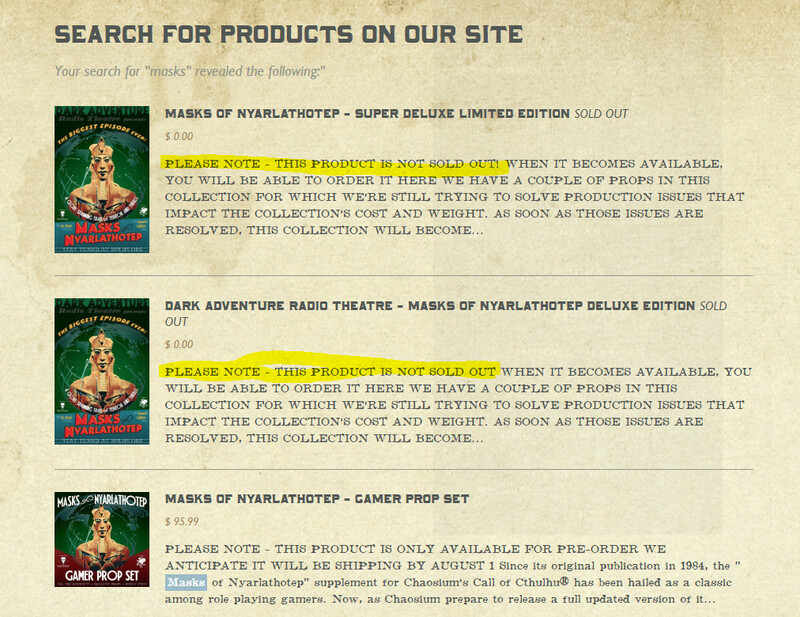 And don’t forget the HPLHS Masks items – Dark Adventure Radio Theatre – Masks of Nyarlathotep, Gamer Prop Sets and more! A heartfelt thank you goes out to EDWIN for editing this episode. Sharpen your number 2 pencils and sit up straight, Mr. Tyler is about to take us all to reform s-GHOUL.